Franklin College in Franklin, Indiana is celebrating its 175th anniversary in 2009. 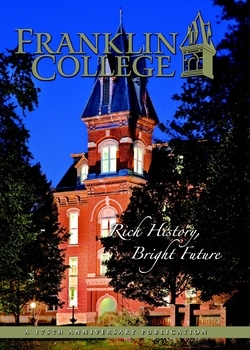 To commemorate this landmark moment in Franklin's history, the College has partnered with Butler Books to publish a full-color commemorative book, entitled Franklin College: Rich History, Bright Future. The book features a timeline of the College's colorful history, as well as 144 pages of archival and dramatic contemporary photographs of the College. This keepsake is an ideal memento for anyone with ties to Franklin College, and an enduring tribute to 175 years of academic service which has remained true to the founders' original mission of providing an exceptional liberal arts education.